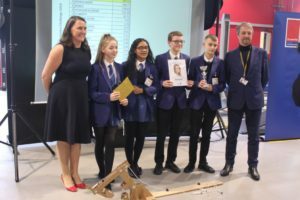 Congratulations to the Highfield team who won the Blackpool Gazette’s Young Engineers 2019 competition. 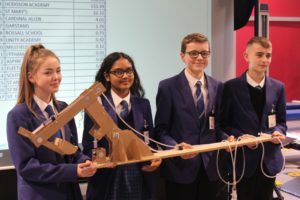 The team of four pupils beat off tough competition from 16 other local schools to scoop the top prize of £10,000. 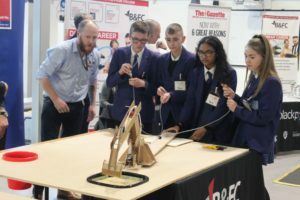 The competition, which was organised by the Blackpool and The Fylde College, saw teams of 13 to 15-year-old pupils design and construct a syringe pump operated digger. The digger had to move rice from one container to another, with the team that moved the most rice named the winner. After an impressive first round, which saw pupils Mia Beilby-Duckett, Amalia Golam, Lee Black and Blue Ayres take an early lead, the team managed to hold onto its lead throughout the contest to be crowned winners. 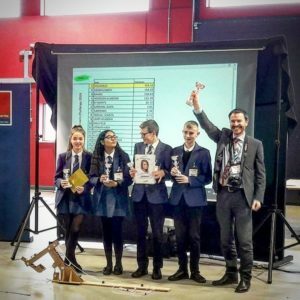 The judges were extremely impressed by the quality of our pupils’ engineering work during the competition, which was held at Blackpool and The Fylde College’s Advanced Technology Centre on Friday 29 March.